Based in Skagen, Denmark, Hans specializes in underwater film production, filming, editing and distributing on VHS, DVD and for the Internet. He also does website programming primarily for the diving industry. Hans started scuba diving when he was 15 years old, more than 24 years ago. In 1994 he began doing underwater still photography. That year Hans won the Danish championship for underwater photography in a competition organized annually by the Danish Sportdiving Association. Currently, his work is primarily underwater and "topside" digital video. Hans is presently working on several film projects. Certified as CMAS ** diver, CMAS Basic nitrox, PADI nitrox and PADI Semi Closed Rebreather diver. He currently dives a Dräger Dolphin mrk4 rebreather. Check out his website, Skawdiver.dk . Born in Spain, Leandro moved to New York with his family. During his High School years he joined a vocal group; and when he turned fourteen won first prize at a musical festival at the New York world fair. The Tokens, who by then had a number one hit on the charts (“The Lion Sleeps Tonight”), became their producer. Leandro recorded several records with them, and spent most of his time then promoting and touring the states with his group. He took up flying as a hobby and earned his private pilots license at the age of nineteen. In 1970 he returned to Spain, where he recorded several records, including a double LP (“The Four Seasons” by Vivaldi ) and also wrote several music scores for various motion pictures. In 1973 Leandro decided to turn his hobby into a career and became an airline pilot. Today he’s an Airbus 340 captain flying for a major international airline company. Mike bought a camcorder and housing in the fall of 2001 and has used it to annoy fish, crustaceans, nudibranchs, cephalopods, his fellow divers, and any other taxa of plants or animals that happen to find themselves in front of the lens port. Mike lives in Oakland, California, where he photographs mushrooms and teaches beginning mycology courses. He writes geeky computer books for a living and goes diving with his wife Lynn in warm tropical waters and the cold green waters of California. Visit Mike's website for more of his video. Richard operates out of Palau, Micronesia and runs an underwater imaging concession with a dive shop there providing him with lots of opportunities to film at some of the best dive sites in the world. A keen photographer too, Richard enjoys opening up the incredible underwater world to people through his images and footage. Email Richard at photoshop@fishnfins.com. Beginning his diving career in 1989, Matthew purchased his first video camera and underwater housing in the spring of 1990 and began filming shipwrecks along the New Jersey coast. Moving to Kona Hawaii in 1994, he began his love affair with warm water reef animals, especially filming their behavioral patterns such as hunting, mating, and color changing. In February of 2000 he found a new obsession with black water diving and filming pelagic gelatinous animals. Deborah and Pablo left the UK and Argentina, respectively, to follow their passion for underwater video. They formed their independent company, FishEyeFilms, in Cozumel, Mexico ten years ago, and have been filming there year round ever since. See their work at: http://www.oceanfootage.com/sellers/pbarco. Email Pablo and Deborah. Joe started blowing bubbles in 1967 at the age of ten when his father rented a two-hose regulator and tank from a gas station/diveshop in the small town of Yucaipa, CA. The influence of Sea Hunt’s Mike Nelson and The Silent World of Jacques Cousteau were just too much to ignore. Over the years he’s been involved with many types of diving, including instruction, research, and technical sport diving. Somewhere along the line the idea of taking expensive cameras and immersing them in saltwater seemed like a good idea. He’s been professionally making images and writing articles since 1999. Published credits include numerous magazines, books and commercial stock images represented by age fotostock, Pixtal, SeaPics, and Waterframe. Visit Joe's website. J.D. graduated from Florida Tech with a degree in commercial diving in 1978. Shortly thereafter he received a call from The Scuba Club, Inc. in West Palm Beach, Florida with a job offer. That was June 1980 and he has been there ever since. He is a USCG licensed captain and a YMCA, SDI and TDI scuba instructor. He has been shooting video underwater since 1987. In addition to running daily dive trips in West Palm Beach, he takes groups of divers to many dive destinations around the world. JD's photographs have appeared in publications such as Ocean Realm, National Geographic World, Sea Frontiers, Outdoor Explorer, Skin Diver, Scuba Times, Underwater USA, the Palm Beach Post and the Sun-Sentinel. Besides the local networks, JD's video work has also been seen on National Geographic Television, the Travel Channel and the Animal Planet. Visit J.D. Duff's website. Email JD. Based in the Bay Area of California, Mike Elliott is an award-winning underwater filmmaker based in Monterey, California. He and his wife, award-winning underwater photograper Jody Elliott, have been diving since 2004. Their underwater imaging work takes them all over the world, yet they also enjoy diving right in their own waters off the coast of Northern California. Mike is filming in HD video using a Sony FX1 in a Light & Motion housing, and editing in Final Cut Pro. Visit their Website. Based in Germany, Diana and Christian Fries are avid divers who want to share their passion with the world. Christian started out with digital photography some years ago and made the switch to HD Video in 2007. They are active members in the communities at wetpixel.com and digideep.com. The two travel all over the world and enjoy all kinds of dive spots like British Columbia, Bali and the Red Sea. Christian is now shooting high definition video with the dSLR Canon EOS 5D Mark II. Visit Their Website. Born and raised in San Diego, CA, Bob Gladden is a very accomplished diver and underwater photographer and filmmaker. Since his dive certification in 1963, Bob's diving activities have included commercial and research diving. He has logged over 5,000 dives. An underwater photographer for 17 years, his work has been recognized with numerous awards, and has appeared in publications such as California Diving News, Discover Diving and Skin Diver. His films have been featured in local TV newscasts, TV specials and at numerous film festivals. Bob also contributed a segment to Discovery Channel's "Incredible Vacation Videos." He is currently using Sony VX-1000 and PC-7 digital cameras and Gates underwater housings, with nonlinear editing in Adobe Premier. He is one of the founders and organizers of the San Diego UnderSea Film Exhibition. Bob's work is available through OceanVisions Productions. Visit Bob's website. Email Bob. Bryce Groark is a PADI Master Scuba Diver Trainer, TDI Semi-Closed Circuit Rebreather Instructor as well as a DAN and PADI Oxygen Instructor. His passion for the ocean grew even stronger when he started shooting underwater video in 2001. He strives to document every aspect of the ecology associated with coral reefs, although sharks and pelagics are his favorite subjects. Jen Groark too loves the elasmobranchs, but her real passion lies with the small, strange, creatures disguised amongst the reef, which she has a unique talent for finding. Today, you can find Jen and Bryce shooting video and taking pictures underwater almost everyday, documenting the local fish behaviors on the Hawaiian reef and teaching Coral Reef Ecology classes to visitors aboard the FairWind II in Kealakekua Bay. Visit their website, LivingOceanProductions.com. 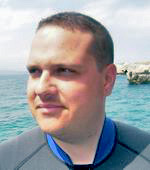 Eric Hanauer is a widely published writer and photographer specializing in the underwater world. Author of three books and over 500 articles, his work has appeared in posters, magazines, books, and CDs. Hanauer is an Associate Professor Emeritus in the Kinesiology Division at California State University, Fullerton. An aquatics specialist, he trained over 2500 scuba students, and introduced the grab start to competitive swimming while coaching in the 1960s. He recently dived into underwater video. Eric is one of the organizers of the San Diego UnderSea Film Exhibition. Visit Eric's Website. Shawn Heinrichs is an independent videographer and filmmaker based in Boulder, Colorado who specializes underwater and adventure travel. His work includes projects for both broadcast and corporate customers. Shawn began diving in 1990 while attending university and immediately fell in love with the sport. In the late 90’s he entered the world of underwater still photography and realized that underwater imagery would become a life long passion. It didn’t take long for the desire to “tell the story” vs. “capture the moment” to take hold of him. He invested in a Light & Motion underwater video set up and never looked back. Last year Shawn made the switch to HD. This has opened a whole new world of opportunity and challenge, and the results have been exciting. His specialty is capturing wide angle footage of large pelagics such as sharks, mantas, game fish and marine mammals. Shawn is also dedicated to marine conservation and is active in a number of conservation initiatives. His video offers a perfect medium to capture the majesty of underwater realm and communicate it to the world in hopes of gaining better appreciation, understanding, and action. Visit Shawn’s website, Blue Sphere Media. An active member of the San Diego community since 1972, Mick is no stranger to filmmaking and editing. He has shot film segments for inclusion in real estate marketing campaigns, a documentary for a TV promo for the Scottish Highlands Games and a documentary for the San Diego city council on swimsuit optional beach use, among others. Taking a video camera underwater for the first time in the spring of 1999, Mick is now irrevocably hooked. He is one of the organizers of the San Diego UnderSea Film Exhibition. Mick edits on MediaStudio Pro. Based in Ireland, Vincent has been diving since 1972, and filming underwater since 1987. Qualified as a Geologist in 1983, he eventually migrated into computers, programming and digital graphics, working for Microsoft for 12 years. Vincent set up Wild Ireland on-line and print Magazine. The on-line magazine won an award for Best Website of the year in 2000, while the print version won a PPA Best Consumer Specialist Magazine of the Year Award in 2002. In 2000, he filmed, photographed, wrote and web broadcast the natural history of nesting Jackdaws which won a Prix D'Europe award. A documentary of the production appeared on RTE Television. In 2001 the 2nd series of Jackie and Daw appeared on UTV. In 2002 Vincent took 46 Irish people to Antarctica and made a film which appeared on TV3. In 2003 he began filming, photographing and painting marine Wildlife fulltime. Together with Patrick Kavanagh he made a 2 hour DVD on Ireland's Marine Wildlife "Ireland - Seabirds and Marine Life." In 2006, they filmed with the BBC's Blue Planet Team documenting "The Search for Ireland's Giant Turtles". This was broadcast on BBC2 in February 2007. Vincent is an accomplished wildlife illustrator. To learn more about Vicent diverse work, please visit his website, www.VincentHyland.com. Email Vincent. Ray works as a network engineering consultant these days. In former lives he was a roofer, a rock climbing bum, and an analytical chemist. He now lives in Redmond, Washington, near the murky waters of Puget Sound. Certified in Utah in 1987, Ray did his qualifying dives in a hot water spring in the desert near Wendover, Nevada, that was once used as a target for bombing practice by the Air Force. Since then he's lived and dived all over the world, yet has never seen an area he could say was more beautiful than the waters around Vancouver Island in British Columbia, Canada. "Diving in those cold waters is not for everybody, but somehow you forget how darn cold you are when you see the overwhelming beauty of 'outside' Barkley Sound." Ray admits, though, that given a choice, he'd choose Indonesia over Canada any day. He's done 35 mm underwater photography almost since he was certified, but was never very good at it. When he finally flooded his Nikonos V, he decided to try video. Ray enjoys shooting video underwater a lot more, and has never looked back. Email Ray. Huw is a film editor and photographer, working in broadcast since 1995. He has edited documentaries and television programs for National Geographic Channel, Discovery, BBC. In 2008, he was awarded an EMMY award for editing History Channel's 'How The Earth Was Made'. New to underwater filming, Huw has been diving since 1997. Visit Huw's website, huwjenkins.com. for broadcasters and corporations. Bent uses a SONY PD170 in a Gates Video Housing. He is currently working on a documentary about underwater wildlife in Scandinavia, cooperating with several Danish aquariums and researchers. Bent is an avid naturalist, diver and sailor. Check out his website at: www.chilbal.dk • Email Bent. Leaving the TV industry in 1992 after 15 years as an editor, effects editor and director, Rod also previously worked on music videos and commercials in addition to network shows. He became a PADI instructor in 1992 and worked as an instructor and dive guide until 1998. Rod worked three sessions for Club Med and four years in Kona Hawaii. Currently residing in Venice Beach, California, he has traveled and dived all over the world. Rod is an innovator in streaming underwater digital film, and has been involved in internet streaming and website design since 1996. His current clients include The Pacific Aggressor Fleet (www.livedivepacific.com), Diving Unlimited International (www.dui-online.com) and Naia Fiji, among others. 1998 DV Magazine Media Masters Award nominee. His website is http://www.rhkuw.com. Email Rod. Based in Montreal, Canada, Nathalie founded Pixnat in 1993. She has traveled the world as a cameraperson working on documentaries, and has worked as a DOP on all kind of productions, both video and film. After years of diving, she now also works as an underwater cameraperson. Nathalie really enjoys wrecks and archeology, but always has fun with seals and other underwater marine life. You can contact her via her website: www.pixnat.com. Jeff started diving in 1961 at age 6 (after threatening to run away from home if his parents didn't buy him a skin diving suit). He graduated from Stanford in 1976 and headed for Hawaii. He's been blowing bubbles ever since and has logged over 11,050 dives. Based in Kona on the Big Island of Hawaii, Jeff's matchless patience and easygoing nature make him a perfect Instructor for Intros and others who want to surrender to the spell of our tranquil liquid paradise. Jeff will also capture your most treasured moments on video, edit and set it to enchanting music so that you can relive your diving experience again and again. Jeff is an owner and managing partner of Jack's Diving Locker in Kona, Hawaii. Visit the Jack's Diving Locker Website. Email Jeff. shoots video mostly in BC waters, using a Sony Handicam inside a Gates housing. Check out more of his video work on his website at coralreeffilms.com. Email Mark. Dr. Terry Maas is a veteran freediver and award-winning underwater filmmaker. He started diving when he was 14 years old and has been freediving steadily for the last 47 years. He holds numerous spearfishing records and championships. His 1992 video Bluewater Hunters for PBS has been viewed by over 25 million people. His diving has been featured in such publications as Sports Illustrated, American Airlines magazine, The Miami Herald and the Los Angeles Times. He lectures nationally using his slides and video presentations to educate those interested in the adventure of bluewater hunting and marine resource conservation. While Terry remains an avid hunter, he is very selective in his take and is deeply concerned with conservation of the ocean’s marine life. He shares his underwater images of sea creatures captured in commercial poaching nets and on hooks with many environmental organizations. He is an active supporter of Sea Watch an organization dedicated to the preservation of the Sea of Cortez in Mexico. In California, he is a member of the committee to form Marine Protected Areas off the coastline. Learn more about Terry and his work on his website at freedive.net. Nick Martorano was born in Italy and moved to the United States in 1993. From an early age he was interested in the ocean and its creatures, as well as photography. In 1998 Nick became Scuba certified, and soon after he started shooting still photos with an underwater camera. After two years of underwater still photography, in 2000 he picked up an underwater video system, and has been passionate about underwater filmmaking ever since. He enjoys filming a wide range of marine subjects, from sharks and mantas to itty-bitty stuff, like nudibranchs and blennies. Nick has contributed to (and occasionaly won) many international competitions such as the Los Angeles Underwater Photographic Society Competition, the World Festival of Underwater Pictures in Antibes, France, the Northern California Underwater Photographic Society Competition, and the San Diego Undersea Film Exhibition. He uses a Sony PD100 in a Light & Motion Bluefin 900 housing, with Sunray Pro HID lights. Nick edits on a Mac with Final Cut pro, Livetype, Motion, and authors to DVD with DVD Studio Pro. Visit Nick's website. package a segment of the PBS Series, "Secrets of the Sequence," shot on location at the Lizard Island Research Station off the coast of Australia. Rick has continued pursuing his passions for diving and the environment offering his services as a broadcast technician and producer and has recently completed projects for The Nature Conservancy, The New England Aquarium, International Fund For Animal Welfare (IFAW), University of Connecticut, The Conservation Law Foundation, Cape Cod Commercial Fisherman's Assoc., The Gulf of Maine Research Inst, and many others. Visit Rick's website. Email Rick. Diving since 1984, Michael has been an active member of the Underwater Photographic Society since 1987 and active in the film festival, as well . He started underwater video in 1995 and travels frequently to Mexico and the Philippines. Michael is currently using a Sony VX-1000 and a Sony PC-7 with Gates underwater housings. Emmy Award-winning Chuck Nicklin has filmmaking experience in Imax, Omnimax, Circlevision, 70mm, 35mm, 16mm, Panavision, digital film and video formats. Feature film credits include The Abyss, The Deep, Never Say Never, For Your Eyes Only, and Love Is Forever. Nicklin's numerous documentaries include "Gentle Giants of the Pacific, ""Behind the Scenes of The Abyss," Nomads of the Deep," and "In the Company of Whales." Truly one of the pioneers of underwater cinematography, Nicklin is actively involved in the diving and underwater filmmaking community. He continues to work hard at his art, while putting much time and energy into encouraging and assisting newcomers to the field. In addition to his filmmaking work, he leads dive tours around the world, and is always willing to take time on his trips to help out the newer underwater filmmaker. Chuck is one of the founders and organizers of the San Diego UnderSea Film Exhibition. View Chuck's new Dive Travel Website. A diver since 1998, Rich purchased his first underwater video housing in 2001 after literally bumping into two whale sharks off Bida Nok Island in Thailand. Moments like that, he reasoned, simply had to be caught on film. Shortly thereafter he realized that hours of unedited footage wasn’t really that fun to watch, so immersed himself in digital editing and began making films. Using music as the underlying structure for his films, Rich strives to create films that are enjoyable to divers and non-divers alike, and yet still communicate the rush of underwater flying. Rich currently lives in Alameda, California with his wife, his daughter, his 200 gallon coral reef aquarium (www.stickycricket.com/aquarium) and his breeding colony of Sepia bandensis cuttlefish (www.stickycricket.com/aquarium/cuttle). Mark is an experienced traveler and instructor/diver who has led expeditions from Africa to Chuuk Lagoon and from the cold waters of Nova Scotia to the tropical magnificence of Palau. If you don't find him the open blue waters, he is probably squeezing through a cave restriction in the Yucatan. His certs include full cave, trimix, SCR, and SSI open water instructor. He is passionate about filming majestic images in harmony with the sounds of the experience. In addition to being an underwater filmmaker, he is an accomplished audio recording engineer. He recently joined the production crew of liquidassets.tv as a sound engineer and cameraman where he will be working on two upcoming television pilots. A few years ago Edward Snijders changed his life by getting into underwater filming after a long - but uneventful - career in air traffic control. Be it air or water, it is the 3 dimensional environment where he feels most at ease. For many years he spent his time underwater just taking pictures. Then some time ago Edward changed to video never to look back. Some successful productions over the years include Reefstory, Seals for Real, Sanganeb and most recently Eau de Bretagne. They screened - and were sometimes awarded prizes - at major film festivals such as the San Francisco Ocean Film Festival, Antibes (France), Belgrade (Serbia), Moscow, Birmingham (UK), Düsseldorf (Germany), Vaasa (Finland) and Seychelles, to name a few. On his website, www.submarines.nl, Edward tries to keep a wetlog, and also presents some of his short films. Edward is founder and director of the annual North Sea Film Festival for underwater movies in the Netherlands, which started in 2007. Though he loves organizing the festival, filmmaking is his priority. Visit Edward's website. Trained as a research scientist, Stephie moved to San Diego, CA in 1997. She became a certified diver in December of 1997, and joined Catalina Divers soon thereafter. She is an active member of the Dive Animals Club in San Diego, and an avid diver at the local shores. Stephie did her first underwater filming during a dive trip to San Clemente Island, California in 1999. Paul Wags is based on the Ningaloo Reef in Western Australia. He has been diving since 1990 and held both Padi and SSI Scuba instructor ratings and personally introduced over 1200 people to the world of scuba diving and guided many many more. Filming underwater is now what he does best, and he continues to capture the magical underwater world for all to see. He has done so many dives, he is now officially a fish and has worked with many TV productions over the years both local and international. Paul shoots with the FX1 in the Amphibico Phenom housing with Aqua Sea HID lights. Stills are with the NIkon D70 in a Sea & Sea SLR housing. Check out his website. A graduate of Brooks Institute of Photography and the marine science program of California State University, Northridge, Emmy® award-winning producer Champ Williams has dedicated his career to the art and craft of underwater natural history filmmaking. Visit his website. Email Champ. John F. Williams, founder of Still Hope Productions Inc., began in 2000 to create underwater videos to introduce Pacific Northwest residents to their underwater neighbors. During eighteen years as a sea-going scientific technician, John visited most of the world’s oceans and developed a deep concern for their stewardship. John filmed & edited the educational DVD "Return of the Plankton." It shows the seasons underwater in Puget Sound and how they affect the critters living there. He has videotaped underwater events and critter behavior for a number of broadcast TV productions and short films. John also produces the only TV series to focus on what goes on underwater in the Pacific Northwest. That bi-monthly series, "SEA-Inside: Pacific Northwest," brings the magic, the mystery, and the beauty of the underwater world into currently over 1.5 million homes. It also provides a wide audience for local underwater filmmakers, photographers, artists, musicians and writers. Visit his website. Email John. Tony Wu is one of Asia's leading underwater photographers. He has won a number of awards, including the Grand Prize for Best Book of the Year at the World Festival of Underwater Pictures in Antibes for his first book, Silent Symphony. In recent years, Tony has been at the forefront of experimenting with new equipment and techniques associated with the crossover from analog to digital technology. The primary theme in his work is storytelling, and he is particularly keen on exploring the unique possibilities opened up by the use of multi-media formats. In addition to his online portfolio, Tony also maintains a blog, where he shares images, video and thoughts from his travels. You can also follow Tony on Twitter.